The Rwenzori Mountain National Park had earlier been described by Ptolemy a Greek geographer in 150AD as Lunae Montes translated as the Mountains of the moon and were thought to be the origin of the Nile River which is the longest in world and one of the natural wonders encountered by Uganda safari undertakers. This earlier notification lured various explorers that followed to fall in mystery of these legendary mountains of the moon and in 1889 Henry Morton Stanley was overwhelmed when he saw this legendary feature while on his Uganda safari. Mount Rwenzori was established as a national park in 1991 covering an area of 996km2 and in 1994; it was given a world heritage site status by UNESCO. The Rwenzori Mountain is the Africa’s third highest peak after Mount Kilimanjaro and Mount Kenya all with in the Eastern region of Africa. Amazingly to note is that Mount Rwenzori peaks are covered by snow despite their closeness to the world main latitude – the equator. The mountain is noted among the challenging mountain ranges to climb in Africa by the African Travel Magazine and is the highest mountain range in Africa. The Rwenzori Mountains have got impressive glacial rivers like Nyamwamba and Mubuku that flow down the mountain slopes with very clear and clean water forming great scenic sights and natural water sources that that gives a real taste of an African landscape. Mount Rwenzori National Park also contain 70 species of mammals, 217 bird species of which 19 are restricted to the Albertine endemics and with great deal of flora that thrive at varied altitudinal ranges such as the montane forest zone on the lower layers of the mountain, preceded by the bamboo zone, tree heath vegetation and Afro-alpine moorland zone. The 70% of the 99,600ha which form the Mount Ruwenzori area occur above 2,500m altitude. The Rwenzori Mountain has got six peaks with Margarita that rises up to 5,109m being the highest followed by Mt Speke (4,890m) Mt Baker (4,843m), Mt Emin (4,798m), Mt Gessi (4,715m) and Mt Luigi di Savoia (4,627m). The Mountains of the moon as was noted by the Greek geographer Ptolemy in 150AD rise to 5,109m making it the third highest mountain in Africa and the tallest mountain range in Africa since Mount Kilimanjaro (5,895) and Mount Kenya (5,199m) are free standing. This makes it worth exploring while on Uganda safari. The Mountain has got series of peaks including Mt Stanley (5,109m), Mt Speke (4,890m) Mt Baker (4,843m), Mt Emin (4,798m), Mt Gessi (4,715m) and Mt Luigi di Savoia (4,627m). The towering peaks have got snow despite their closeness to the equator. The flowing glaciers form the remote sources of River Nile which isd the world’s longest river and present unique scenic views. First explored by Henry Morton Stanley in 1889, the mountain was first summited by the Duke of Abruzzi in 1906. 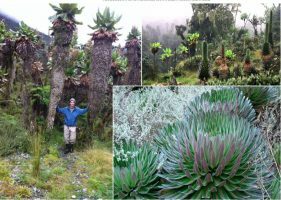 Mount Rwenzori National Park has got more impressive and rewarding flora than its fauna. While on safaris in Uganda, a traveler can explore this lush vegetation that thrives at various altitudinal ranges of Mount Rwenzori. Rising from the altitude above the farmlands of the Bakonzo, there lies montane forest at 1500-2500m giving way to Bamboo stands and messy tangles of Mimulopsis at 2500-3000m. This is followed by Heather- Rapenea zone at 3000-4000m marked by giant tree heathers (Erica spp. ), garishly colored mosses and drab beards of lichen. The impressive giant lobelia forms (Lobelia spp.) and groundsels (Senecio spp.) thrive in this region and continues to the following Alpine zone at 3800-4500m where they meet wiry but pretty thickets of Helichrysum or everlasting flowers. The raised landscapes of Bujuku valley contain Bigo bogs that are marked by tussocks of sedge (Carex spp). Mount Rwenzori National Park has got counts of wildlife including; buffalo, bushbuck, Elephant, leopard giant forest hog and chimpanzee. 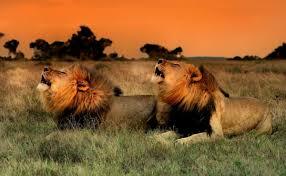 Due to the topography, this wild life is rarely encountered. Other species like hyrax, blue monkey and black and white colobus can be easily seen. 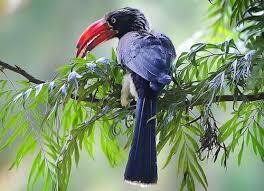 There are 217 bird species that thrive in Rwenzori National Park and 19 of these are restricted to the Albertine rift. Birds in Rwenzori include among others; cinnamon-chested bee-eater, hand francolin, Rwenzori turaco, long eared owl, barred long-tailed cuckoo, flycatcher, Archer`s ground robin, greenbul, white-starred forest robin, strange weaver, golden-winged sunbird, crimson wing, Legden`s busg shrike, montane sooty boubou, Rwenzori batis among other birds. The Malachite sunbird thrives in the higher Alpine slopes. The slopes of Ruwenzori Mountains have supported the Bakonzo and Bamba tribal groups for centuries past and the Rwenzori landscapes are regarded as sacred grounds where they worship and meet their ancestral gods. They have a belief that Kitathamba thrives in the higher mountain slopes amidst snow and glaciers while his wives dwell in the lower moorland and the ridge communities are headed by ridge leaders. The Omusinga (King) of Mukonzo derives his power directly from Kitathamba. Periodical prayer sacrifices were made to ensure the thriving of good harvests, peace and aversion of calamities. Mount Rwenzori National Park contains 217 species of birds of which 19 are restricted to the Albertine rift. This enables birders on Uganda safaris to encounter memorable birding experiences with the opportunity to spot a range of birds that may not be seen on lower altitude areas like Malachite sun bird. 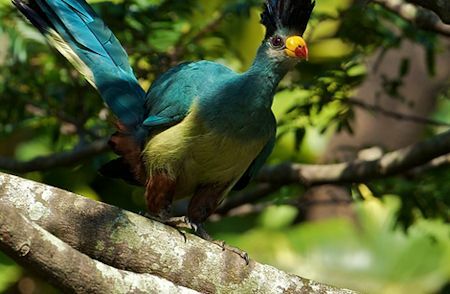 Other bird species that can be encountered include; Robins, Barbets, Bee-eaters, Long eared owl, Rwenzori Turaco, Bearded Vultures, Swifts and Black eagles. There are ranges on nature walks that are designed for first time hikers and limited time travellers to explore the Rwenzori Mountains. 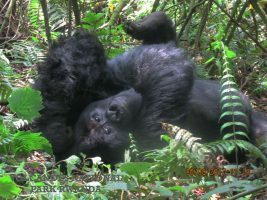 The walks traverse the central circuit passing through Buraro Chimp forest and Lake Mahoma while others go through Kichamba communities extending to Karangura ridge. The Bwamba pass which acted as direct route connecting Fort Portal and Bundibugyo before the road was constructed in 1938. It involves 1,500m hike across the northern Rwenzori ridge which makes it an active hike to encounter while on safari in Uganda. 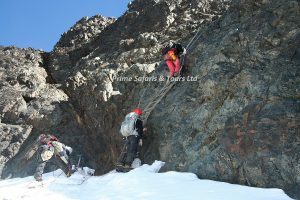 Summiting Rwenzori Mountains formerly known as Lunae Montes – the Mountains of the moon is such thrilling adventure that you can ever have in your life time. Rising up to 5,109m, Margarita peak is snowcapped and is the highest point in Uganda and the third in Africa. 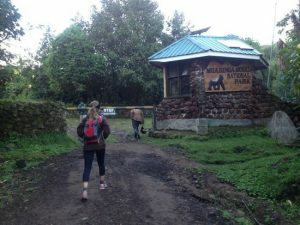 Though Rwenzori Mountains were listed among the challenging mountains to climb on African continent by the African travel Magazine, they can be summited which makes any Uganda safari undertaker interested in summiting it walks in the footsteps of the Duke of Abruzzi who first reached its top in 1906. 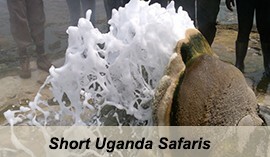 The two trails are designed to enable you achieve your memorable experience in Uganda. These trails include; Kilembe trail and Central circuit rail. 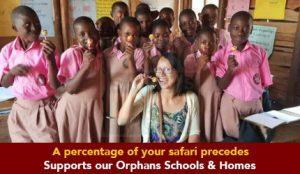 The central circuit starts at Mihunga and takes seven (7) days round trip. Day 7: Descend from Nyabitaba hut to Nyakalengija. The Kilembe trail starts at Kilembe and lasts Nine (9) days round trip including summiting Margarita peak. Mount Rwenzori National Park is surrounded by a range of tribal groups particularly the Bakonzo and Bamba who have thrived in this area for centuries past with great traditions and practices that are worth encountering while on safari in Uganda. The village of Ruboni is considered as settlement area of the Bakonzo for over 2,000 years and they have accumulated a lot of heritage which can be explored on Uganda safari. You can mix up with the community as they undertake their daily routine like animal rearing, cultivation, food preparation along with other activities. The visit to the traditional healer, blacksmith, craft makers and story tellers will give you a detailed host – guest interaction. The Bulemba – Ihandiro cultural trail takes about 6-7 hours traversing the holy valley and other cultural sites of the Bakonzo. You are accompanied by the indigenous guide who will take you to the traditional healer’s home called Muhima as he demonstrates his powers to you. You can also visit the black smith who reveals the value of the Konzo traditional stool. The basket weaving and fire making encounters are incorporated on this trail. Pass by Kamusonge River whose waters are thought to be sweet and faster in quenching thirst. The Konzo Museum can also be explored on this trail exposing the instruments that were used in the Rwenzururu struggle for succession. This is situated at Rwenzori National Park’s entrance offering an upmarket accommodation which is molded out of stones from River Mubuku. The lodge offers. The lodge offers impressive views of Rwenzori Mountains. It features spacious dining area and impressive works of art. 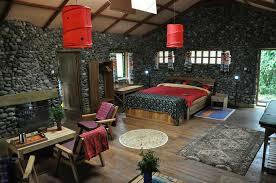 The accommodation is offered in its cottages with bathrooms and windows having clear views of the forest. 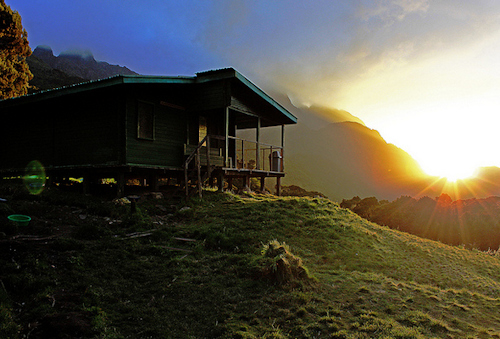 Ruboni Community Camp is situated at the gateway to the Rwenzori Mountains National Park. It has a wide range of choice from camping (own tents), to 6 private rooms with individual washrooms (hot water brought on request) or three self-contained bandas. The camp has got solar lighting, restaurant, balcony, mosquito nets, and private bath rooms, hot overhead showers, running water and showers in bandas. 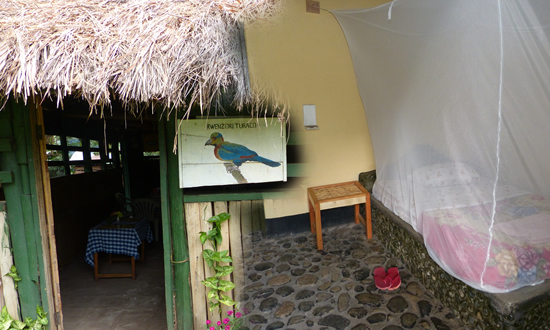 The Rwenzori Turaco View Campsite is positioned in the village of Mihunga and derives its name from the local bird endemic – the Rwenzori Turaco. It features a restaurant, bar and composting toilet. 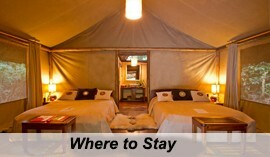 Accommodation is offered in its seven (7) rooms in Banda setting and has camping provision. The rooms feature private bathroom while the camping site has eco-san showers and toilets. This is ideal for mountain climbers that are to use the Kilembe circuit. 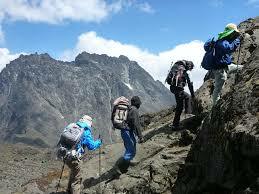 It is operated by the Rwenzori trekking services. Rwenzori National Park can also be connected to by Air travel. Aero link operates scheduled flights to Kasese from Entebbe International Airport. 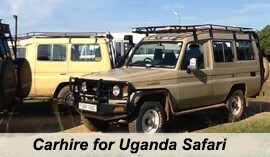 Other charter carriers offer charter services from either Kajjansi or Entebbe Airport to Kasese. You can also connect using public means by boarding buses that connect from Kampala to Kasese daily. From Entebbe International airport to Kasese airport non-stop flights take 1h 2 times daily at 10:20- 11:25 by Aerolink 122 and 14:55-15:55 by Aerolink 122 all week round. 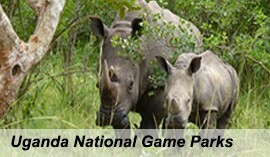 Then a road drive to the national park about 25.9km via Mpondwe road. From Entebbe International airport to Kasese airport via kihiihi airstrip is 1H 50min by Aerolink Uganda. Route 1. Rwenzori mountains national park is 372km via Mubende – Fort portal-Kasese road about 6h26min drive on a tarmac road and this is the shortest route. Route 2. Rwenzori Mountains National Park is 406km via Mpondwe -Fort portal road about 7h 19min. Route 3. Rwenzori Mountains National Park is 423km via Masaka-Mbarara-Kasese road. However, Rwenzori Mountains National Park can be accessed from nearby destinations or during a tailored safari to Uganda. From Queen Elizabeth National Park, Rwenzori Mountains National Park is 2.9kmabout 9minutes via Rwenzori road. From Bwindi Impenetrable Forest National Park, Rwenzori Mountains National Park is 299km about 5h 54min via Ntungamo – Katunguru road and it’s the fastest route. 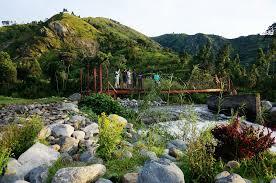 From Kasese town, Rwenzori mountains National Park is 25.1km via Mpondwe road. From Semuliki National Park, Rwenzori mountains national park is 53.3km on a route currently being widened to make your safari in Uganda more comfortable.